Here is s super fun idea to serve up a healthy alternative to chips and dip! 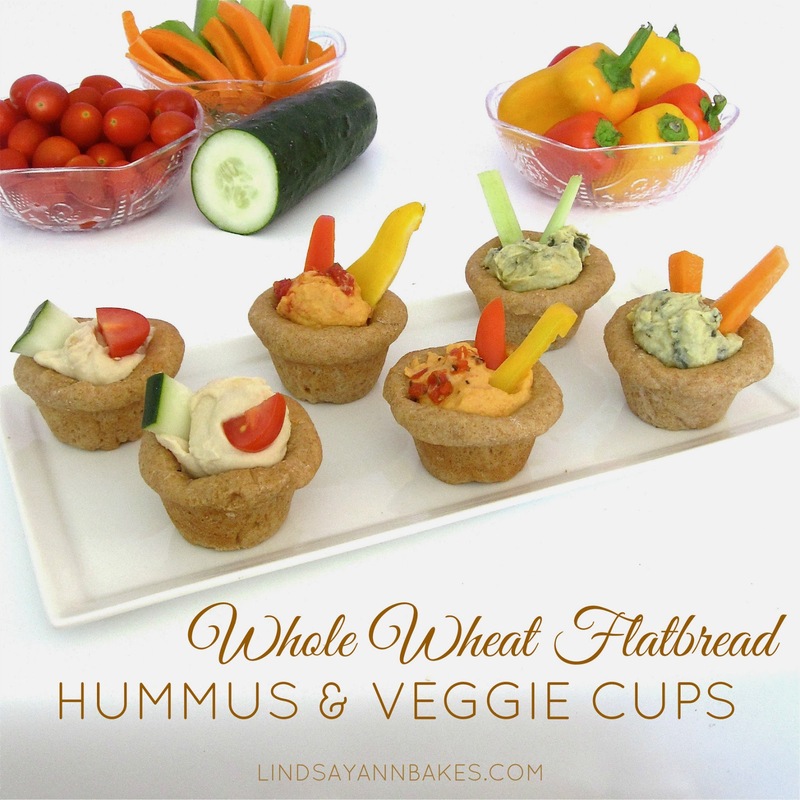 Little cups made of whole wheat flatbread are stuffed with creamy hummus and topped with fresh veggies for a perfect party appetizer or healthy snack, in no time! 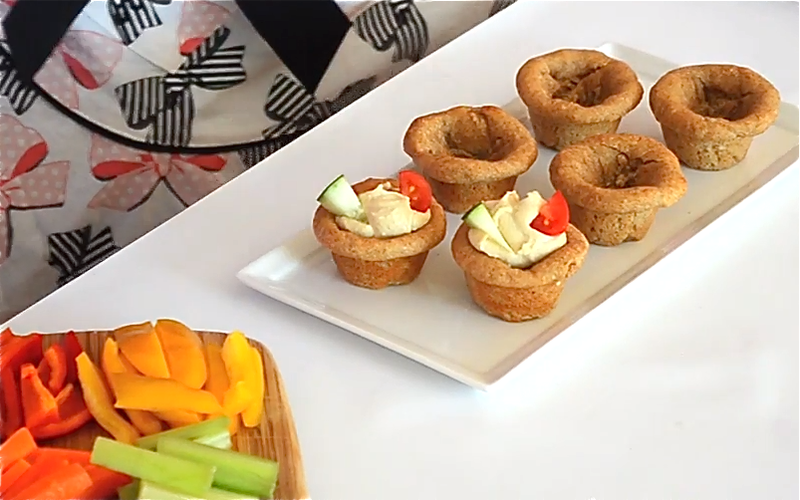 These adorable little cups looks super fancy, but by usinga box of Krusteaz Whole Wheat Flatbread Mix as the base and some store bough hummus, these little cuties come together in minutes for a perfect finger food to impress your guests with! Krusteaz even featured my recipe on their site: CLICK HERE TO CHECK IT OUT! AND, they posted my video on their YouTube: channel! : CLICK HERE FOR THE VIDEO! This recipe is sooo simple to make! After you make the dough, just bake for under ten minutes and press the flatbread cups back into shape with a spoon and you are ready to assemble! I used store bought hummus to keep it semi-homemade, quick and easy, then just top with sliced veggies. Serve and enjoy! It is that easy. Preheat oven to 475°F. Lightly spray a 24-cup mini muffin cups with cooking spray. Stir together flatbread mix and yeast packet. Add warm water and oil, stirring until dough forms a ball. To activate yeast, cover dough and let rest 10 minutes. Press about 2 tablespoons of the dough into each well of the mini muffin tin, pressing it down into the bottom and up against the sides of the pan, creating little cups. Bake for 7-9 minutes or until edges are golden brown. 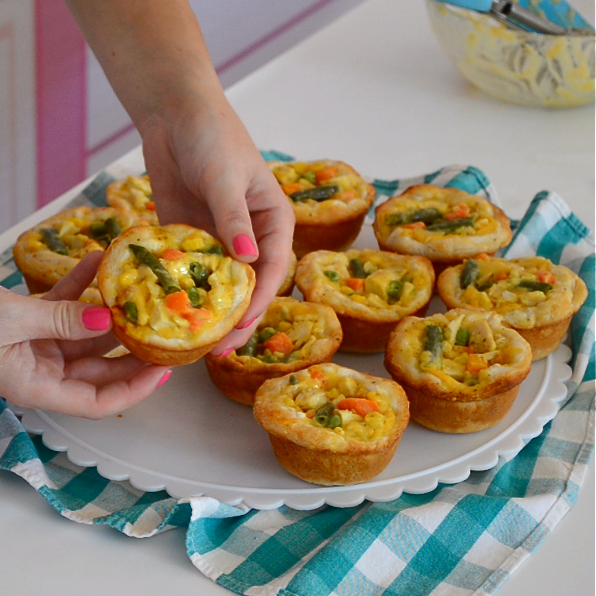 Using the back of a spoon, immediately press flatbread cups back into shape, if they puff up after baking. Remove cups from the pan and fill with a tablespoon of hummus. Top with sliced veggies. Want more fun savory snack ideas? !